Frostburg is a historic main street community with many, “turn of the century,” homes. The community has over 18 churches representing many denominations. Frostburg occupies a unique position in Western Maryland: a growing community in the midst of a declining region. Three major events have shaped the development of the town; the first of these was the coming of the National Pike. This road was the principle route along which westward migration took place during the first half of the nineteenth century. After the National Pike was surveyed, in about 1811, Josiah Frost, laid off building lots just west of the house which had been built a few years before George & Mary Clark McCulloh, and called Mt. Pleasant. Since there was already one Mount Pleasant in Maryland, the name of the town was changed to, “Frostburg,” by the government when a post office was established there in 1820. The newspaper and churches were established during this period as well as the school system (1868), the fraternal organizations, banks and many local businesses. The Fire Department came into being in 1878, the Water Company began operation in 1884, and by 1895, both gas and electricity were available to the citizens of Frostburg. Public transportation to Cumberland and Westernport was established by 1902 by an electric railway and the Miner’s Hospital was built in 1913. A major factor in Frostburg’s economy was the growth of State College. The school grew from an original enrollment of 91 students to over 5400 students that attend Frostburg State University today. The city of Frostburg is a full service community with a population of approximately 8,075 year round residents. With attractions like the newly completed “Old Depot Train Station and Restaurant,” Frostburg attracts people throughout the region. To see and ride behind a steam locomotive, and the Thrasher Museum is also located at the depot, boasting a variety of carriages well worth seeing. Frostburg has 32 miles of streets. The elevation range of Frostburg is 1,950 feet to 2,450 feet above sea level. The 2000 Census population is 8,073. The construction of the new Piney Dam Reservoir increased the capacity from 50 million gallons to 400 million gallons. The water capacity of the Community Swimming Pool is 329,000 gallons. One of the best volleyball courts in the area is located at Calhoun Park. And a charming funeral home (Sowers Funeral Home, P.A.) is located near the center of town. The Sowers Funeral Home, P.A. of Frostburg, has been a family business for 100 years. Alan M. Sowers owns and operates Sowers Funeral Home, PA. Lisa Sowers works as Office Manager. The business was founded in 1907 by Marilou Sowers' grandfather, Jacob Hafer. Back then, the family owned the funeral home and an adjoining furniture store, which was common place back then. The business was continued on by his daughters: Pearl Mattingly, her husband, Frank Mattingly, and Beulah Montesant at 25 E. Main St., Pearl and Frank’s daughter Marilou, as well as her husband, Lowell Sowers, Jr., joined the family business in 1959. The business was then known as Hafer-Sowers Funeral Home. In 1962, we moved to our current location at 60 W. Main St., where the business is still located today. 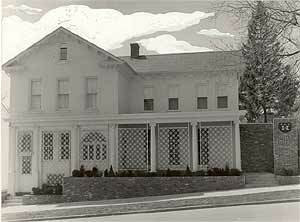 In 1977, in accordance with the laws of the Maryland State Board of Funeral Directors and Embalmers, the name was changed again to its current form of Sowers Funeral Home, P.A. In 1984 the Sowers family purchased a monument business, Frostburg Memorials, which is located only one mile west of the funeral home. Frostburg Memorials has been a nice addition to their business allowing for a more complete service for their customers. The monument business is owned and operated by Alan and Lisa Sowers. Our monument business was purchased in 1984 from Arthur Irwin, which was previously called Irwin Memorials. We then changed the name to Frostburg Memorials. We remained at 60 E. Main St. until, 1991. We purchased the land that was formerly Lotz Meat Market. A lot of effort was put forth with the extensive remodeling of the building. The new location was 19406 National Hwy., NW where we still are today. Serving our customers with personalized service. Frostburg, Maryland, is located on Route 40 West, with exits 33 and 34 off the National Freeway (I-68). Just minutes away from LaVale and Cumberland, Maryland, and just 3 hours from Baltimore, Maryland, and Washington, D.C., a beautiful scenic one-hour drive from Morgantown, WV, and two and one-half hours from Pittsburgh, PA. A large portion of Frostburg has recently been declared a National Historic District.